Horizontal 3x3 Layout with alternating Diamond in Square Classic Pieced block from EQ Library and a modified version of the Uneven Nine Patch block. 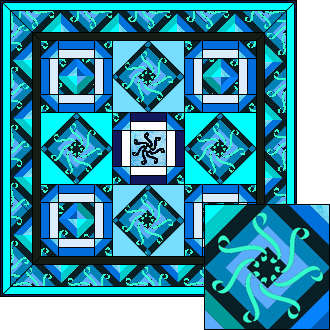 Diamonds & Spirals fabric was rotated and fussy cut to form patterns in both the quilt center and the borders. Spiral Motif appliqué was set on Layer 2 in the center block of the quilt.